It is hard to ignore Jah Prayzah’s music in this era of political transition in the country. His songs, especially “Kutonga Kwaro”, are being played everywhere. Every revolution is oiled by music that resonates with winds of change and Jah Prayzah’s album “Kutonga Kwaro”, which was released 43 days ago, has dovetailed with the greatest political development since the country’s independence – the resignation of Cde Robert Mugabe. When the title of the album was announced a few weeks before its release, some social media users extended the name to “Kutonga Kwaro Garwe” in connotative reference to now-President-designate Cde Emmerson Mnangagwa. Garwe or Ngwena (crocodile) is Cde Mnangagwa’s moniker and that time in September when Jah Prayzah’s album was linked to him – even before people heard the lyrics – the intention was not sincere, but it has turned out to be the greatest prophecy of our time. “The Crocodile” is getting the Presidential throne today and those who say Jah Prayzah is a spirit medium could be right after all. He saw it coming. Although the musician maintains that the relationship between political developments and his lyrics is a mere coincidence, the synchronisation of the two creates a high point of interest, especially with the fact that “Kutonga Kwaro” came after another suggestive album title “Mdhara Vachauya”. “Mdhara Vachauya” means “a respected elder will come” and it was Jah Prayzah’s 2016 album. That album was also given a political interpretation with people questioning who the elder would be. So, if last year Jah Prayzah told us that a respected elder would come and this year announced the arrival of a hero, how best can we describe the musician? Some have concluded that he was deliberately fighting in Cde Mnangagwa’s corner while those who believe in the power of the creative world suggest that Jah Prayzah indeed has a gift of foresight and his insinuations should never be taken lightly. Whichever side one chooses to take, the truth is that Jah Prayzah was on point and saw today’s events when some people did not believe it would happen while others actually vowed that it would never happen. Today it is happening when Cde Mnangagwa will be sworn in as the country’s President. As Jah Prayzah foresaw in 2016, mudhara vazouya and as he declared 43 days ago, kwave kutonga kwaro gamba (or Garwe, to be precise). It is obvious that Jah Prayzah’s music will dominate the celebrations as it did during that historic march to State House last Saturday. The song “Kutonga Kwaro” was an anthem during the march and some who did not follow Jah Prayzah’s music “repented” on the day. Although the album was steadily doing well on its own, the current political change has catapulted it to dizzy heights. Jah Prayzah now has more admirers and he has become a hero of the revolution. In the heat of factional wars in Zanu-PF, Jah Prayzah became a target of the G40 as some in that sect openly castigated him for pushing Cde Mnangagwa’s agenda through his music. Some people even claimed that a series of attacks on Jah Prayzah last month were instigated by the G40. Whether it is true or not, it is a fact that Jah Prayzah would not be celebrating the way he is doing now if G40 had succeeded in flooring Cde Mnangagwa. His world was slowly crumbling around him and when this writer phoned him a few days after last month’s attacks, he said he was taking a breather in his rural area and seeking guidance from his father. He was apparently sensing danger. Jah Prayzah was welcomed Thursday afternoon by hundreds of fans at the Robert Gabriel Mugabe International Airport as he landed from Australia where he had been on tour. But this week’s picture is completely different. Jah Prayzah reportedly stole the limelight in South Africa on his way from Australia and a mega welcome party was planned for him yesterday as he flew back home. His fans organised a party to welcome their hero. His manager Keen Mushapaidze on Wednesday posted a picture on Facebook celebrating the new era. 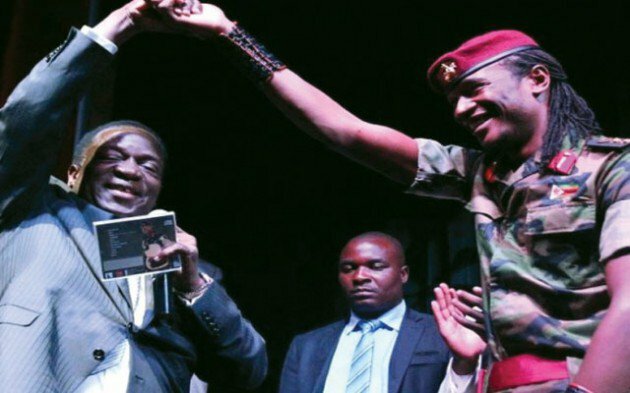 Indeed, Jah Prayzah is a hero in this transition.Like many other musicians before him that include Simon Chimbetu, Thomas Mapfumo, Cde Chinx and LMG Choir that were credited for boosting morale during the liberation struggle, Jah Prayzah has been lauded for music that has united people in the dawn of a new era. Meanwhile, the musician has planned a celebratory show set for Harare International Conference Centre tonight. The show was hastily organised and announced yesterday as the musician arrived back home from his international tour. His camp said they would celebrate with their fans at the giant events facility that is expected to be packed to capacity.